Client Testimonials, ratings & feedback for Knockout Challenge Ltd.
We asked our clients to rate us from 1 to 5. Without omissions or manipulation here are the results…. 100% - Will you contact us again? I just wanted to say a huge thank you to the team who were with us last week. From start to finish they were extremely professional, amazing with the children (and the staff! )really entertaining and very organised. We all had a thoroughly enjoyable day and will definitely be booking again. The buzz around school both on the day and for the rest of the week was brilliant! We have recently booked Phil and his team for the third year in a row and cannot recommend him highly enough. Last year the Knockout Challenge team coordinated games for over 600 participants at our charity event and we literally did not have one complaint – and having just launched our dates for this year’s event, we have people very keen to participate for a third year in a row, whilst still also attracting new people etc. This acts as a perfect reference in our eyes! Thank you for another brilliant it’s a knockout day. We have had some great feedback already, as well as people saying they want to sign up for next year. Morning Phil, I just wanted to say a HUGE thank you. Your team were brilliant, we had a fantastic day and the children and adults had so much fun. Your guys were true professionals and excellent in the set up and management for the whole kit. They all had an excellent rapport with the children and staff alike and this really added to our experience. It was the first time we have ever booked anything like this and we were very impressed and would definitely recommend and book again. Please pass on our thanks – everyone worked tirelessly. Hi Phil, A very huge thank you to you and the team for such a great day today, everyone had a fab time and really enjoyed themselves – some were rather surprised they actually enjoyed themselves as much as they did! It was a pleasure as always to work with you and I look forward to another opportunity in the not too distant future. Have a great summer. Hi Phil, Just wanted to pass on our thanks to Tom and the crew for running our session today. They were helpful and professional throughout our session and even forgave me for my disorganisation in getting started! Everyone had a fabulous time and the staff can’t wait to have a go next week when you return. Please pass on my thanks. I just wanted to say a huge thank you from the School for the terrific afternoon of fun you gave the U6th yesterday. You really do manage the boys and their humour so well. The boys hugely enjoyed the afternoon and all fully committed to it. How lucky we were with the weather again. The boys had a very memorable send-off. Many thanks. Looking forward to next year. Hi Phil, I just wanted to thank you for everything you did for our event at the weekend and if you could pass this on to the guys who attended please. Everyone had a brilliant time and the day was a massive success. We have loads of images on Facebook should you wish to see any of them. All the best and will more than likely be in touch for next year after the positive feedback from those taking part this year. Hi Phil, I just wanted to say thanks to your team for our RSPCA fundraising event in Bristol on Friday. They were organised professional and very helpful and they ensured that everybody had a really good time – so much so that lots of people wanted to know when we would be doing it again. I would happily use Knockout challenge again and recommend them to other people. Masses of feedback about how utterly brilliant you were and how did I find you, and book Cheggers etc. etc. Everyone was seriously impressed at how authentic and professional it was – I think expectations were middle of the road and of course you then blew their minds and tested them to the limits! As ‘organiser’ you made me look great! 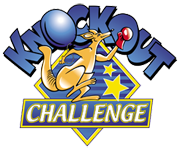 We have employed the services of Knockout Challenge for two occasions and would highly recommend them to any prospective client who may be hoping to hold such an event. All who took part in the games had the time of their life. The friendliness of the staff and Health & Safety aspects are first class and we most certainly would employ them for another Knockout Challenge. Hi Phil, Just a quick note from all the team here to say a big thank you to you and your team for the very successful, hugely fun “Knockout Challenge” last Friday. Everybody was impressed with the professional set up and the great variety and quality of games. Much fun was had by all! Thank you for all your help in the planning and booking. We hope to hold another ”it’s a Knock Out” again in the future. Just a quick email to say thank you very much for Friday. Your efforts were greatly appreciated, as ever our kids had a wonderful time thanks to your staff who were cheerful, helpful, professional, organised and, most importantly made sure the kids had a great time. Please thank them from us. Big, big thank you and hope to work with you again next year. I would like to thank the staff at “Knock-out Challenge” for helping to make our event a thoroughly enjoyable day! The feedback we’ve received so far from employees has been very positive, everyone seems to have enjoyed the games. I would like to thank Kevin in particular, he was very patient and ensured everything ran smoothly. Thank you so much for such a great day. I’ve had so many emails from people this morning saying what a great time they had. We honestly couldn’t fault it. The day ran so well and everyone really got into the spirit and had a great time. Many thanks to you and Tom for yesterday. It was a really great day, the client had a brilliant time and thoroughly enjoyed themselves. I can see why your testimonials ‘shine’ – great facilitation. I really hope that we can procure more work and have the opportunity to work together again. We’ll give it our best shot! Thanks again for such a great weekend. We’ve had fantastic feedback and the emails still keep coming through which is great. Here are just a couple of them. Just a quick email to thank you to you and all your team for the event, Your staff were professional and motivating throughout the afternoon. The feedback we have received from the staff members has been brilliant, all walking (hobbling) around the office on Friday morning with big smiles on their faces. Also thanks for accommodating our request for the director showcase event which was the perfect end to the events. On behalf of all of us, we would like to say a massive thank you to you. Your boys were AMAZING, created such a good atmosphere, we had the BEST day and it wouldn’t have been half as special without you guys. We were all crying with laughter by the end! If we can write a reference or do anything to say thank you please let us know. A million thank you’s for being so friendly, helpful and accommodating. Please send our best to the boys and say we can’t wait to see them all next year!